Most frogs must avoid freezing temperatures, as it may cause their cells to dehydrate and collapse. The cold temperatures also prevent frogs from moving quickly enough to capture food and avoid predators. To survive during cold weather, most frogs seek shelter in rock crevices, burrows, leaf litter or underwater when the mercury falls too low. Some of the most common retreat sites for terrestrial and arboreal species are rock crevices. By venturing into crevices that penetrate below the frost line, the amphibians can avoid freezing temperatures and safely sleep through the winter. Additionally, the rocks will warm in the sun and slowly radiate that heat during the night, helping to further protect them from the cold temperatures. Spring peepers (Hyla crucifer) -- who normally inhabit the trees -- sometimes move to rock crevices during the winter. Tunneling below the soil can help amphibians avoid freezing temperatures as well. Some frogs, such as spadefoot (Scaphiopus ssp.) and American toads (Anaxyrus americanus) dig their own burrows, while others utilize the burrows of rodents, turtles and other animals as hibernation locations. Some species use burrows and tunnels during most of the season, so they don't have to move far when winter arrives. In deciduous forests, terrestrial frogs are often able to use the leaf litter as insulation from the cold. While helping to trap the heat of the earth, the frogs also benefit from the decomposing leaves, which produce a small amount of heat. This strategy is most common among frogs living in areas with mild winters or among those species with physiological adaptations to the cold, such as wood frogs (Rana sylvatica). Wood frogs use glucose in their cells as antifreeze, which allows them to endure repeated freezing and thawing cycles with no ill effects. Aquatic frogs, such as leopard (Lithobates pipiens), pig (Lithobates grylio) and bullfrogs (Lithobates catesbeiana), hibernate underwater. As the temperatures drop, the metabolisms of the frogs drops as well, lowering their food and oxygen demands. The frogs move to the bottom of the lake or pond, and essentially go to sleep. They are able to supply their lowered oxygen requirements by absorbing oxygen directly from the water via their skin. Frogs that hibernate in sufficiently deep water benefit from a peculiarity of water's physical properties: Water reaches its highest density at 39 degrees Fahrenheit. This means that near the bottom, the water stays a near constant temperature throughout the winter, further protecting the frogs from freezing. 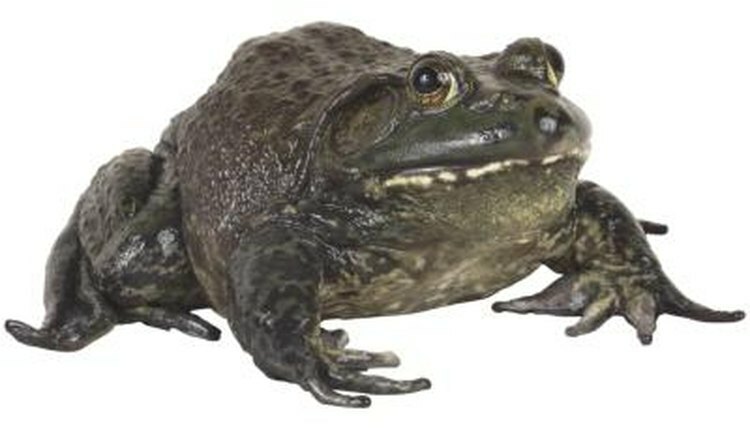 Scientific American: How Do Frogs Survive Winter? Why Don't They Freeze to Death?